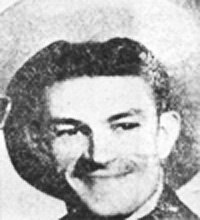 Mal Allen, a native Tennesseean turned Californian, was a singer / disc jockey who interupted his musical career several times. He'd be in music for a while, then go to the military service (Naval Air Corps) or trying law school at one time, but in between, came back to doing something with his musical talents. In 1953, he was working at radio station KECC out of Pittsburg, California. An article in 1953 indicated he had been there as a disc jockey nearly two years. Mal Allen and His Melody boys were also doing dance and night club engagements in the area, too. Mal Allen recorded for a time on the Intra STate label and they indicated that one of their releases then was "Full Moon" (a song he wrote) along wiht "Hold Me A Little Bit Closer".